Artificial intelligence is transforming Google's yellow sticky note app into an indispensable peripheral to your own mind. Google Keep is probably the best Google service that most people don't use. Services like Keep, Evernote and Microsoft OneNote are often called "note-taking apps." But it's an obsolete label. They've grown beyond their roots, now offering collaborative workflow, reminders, checklists, geofencing, optical character recognition, voice transcription, sketching and more. A few years ago, I would have recommended Evernote. But over the summer, Evernote took a wrong turn. The company changed its pricing structure in a way that practically forces users to pay or quit. Specifically, Evernote added limitations to the free version, called Evernote Basic. It's now accessible via a maximum of two devices per year -- a total deal-killer, as far as I'm concerned. They limit uploads to 60 megabytes per month, which is absurdly low. And they raised prices on premium tiers. Microsoft OneNote is a great choice for people invested in the Microsoft world -- Windows users who subscribe to Microsoft Office 365 or who carry a Windows Phone. Apple Notes is rudimentary, but ideal for people who use a lot of Apple products but not many Google products and heavy Siri users who feel comfortable in the warm embrace of iCloud. For most people, however, I recommend Google Keep, especially for anyone who uses the many products Keep integrates with. These include Chrome, Calendar, Gmail, Photos, Drive, Docs, Google Now, Google Assistant and Google Home. The integration of Keep with these other apps is powerful stuff. Some people still think Keep is just a dumb sticky-note app. I'm here to tell you that since Keep launched more than three and a half years ago, Google has quietly added so many new features (many leveraging Google's powerful A.I.) that it's a completely different product now. Google will almost certainly unveil an API at some point, enabling third-party companies to create apps and services that read or write notes. Meanwhile, Google will probably integrate Keep deeper into a growing range of Google products. The most transformational of these integrations will be into the Google Assistant, Google's next-generation A.I. virtual assistant. In the same way Assistant will scan your email, calendar and other data-packed Google apps, Assistant will also scan Keep and make all the information in Keep available to you through a conversation or chat. When Assistant can use Keep to remember things for you, it will feel like part of your mind. It will whisper reminders in your ear and provide you with any information in Keep whenever you ask for it. So if you plan to use Google Assistant, now is the time to start populating Keep with all your personal facts, information and ideas. Besides, I think Keep is already the best note-taking app out there. Here are the amazing things you can do right now with Google Keep. When you get an idea or encounter information in the world that you want to remember forever, Keep captures quickly. Use a widget on the Today screen for iOS or home screen on Android for one-tap capture. The widget shows four buttons: "Note," "List," "Photo" and "Audio." One tap and you're off to the races. iPhone users: Place the Keep icon as one of your four "Dock" icons for quickest access. If you've got an iPhone 6s or later, use 3D Touch: Press hard on the icon and choose from "New Audio Note," "New Photo Note," "New List" or "New Note." The fastest choice is Audio -- just select and talk, and your words will be captured and even typed out in searchable text. If you need to capture written information -- on a whiteboard, sign, business card, menu, article, contract, license plate or even a screen -- tap the "Photo" button and take a picture. Keep scans and captures the words in that photo, making the note searchable. To extract the words, tap on the photo and choose "Grab image text" from the menu. The words in the photo will be transformed into text. You can also import into Keep photos you've already taken, and those will be scanned, too. The word-scanning feature works for the English language only, but Google Keep project manager Mario Anima told me more languages will be added in the future. Of course, you can also choose "Note" or "List" to capture free-form text or checkbox lists. In a "Note," you can use asterisks or hyphens for bullet lists, and Keep auto-creates the next bullet. In a "List," Google uses A.I. to guess what items you're adding, which speeds up list-making. If you use Google's Chrome browser, Install the Keep Chrome extension app -- just go to the Keep site and find the app page option on the hamburger menu. By pressing the Keep button that the browser extension installs, you'll capture a link to the currently selected tab, with an opportunity to add a note. Speaking of browsers, open each of your most frequently used Keep labels in a separate tab for quick capture and reference while using your PC or laptop. When you're already in a specific label category, new notes will automatically be tagged for that category. Or, better yet, run the Chrome browser app, shrink it to a skinny column and keep it open next to your browser for instant access while you work. Google Keep has an amazing search function. But when you click or tap on the "Search" icon, and before you can even search, you'll be presented with options for finding stuff. These options include note type ("Reminders," "Lists" and "Photos"), labels (which you can create by either using the pop-out menu or by creating hashtags in the notes; each note can have as many labels as you want), people (the complete list of people you've shared notes with or who have shared notes with you), things (Google's A.I. auto-categorization of your notes, which includes categories like "Books," "Food," "Movies," "Music," "Places," "Travel," and others) and colors. Google Reminders is a feature that spans three products: Inbox, Keep and Calendar. The feature lets you be alerted based on time and date or location -- for example, you can set a reminder to pick up your dry cleaning next time you drive near the cleaner's. You can also set recurring reminders. The Keep interface for Reminders is better than in Inbox. You can use the full range of options: "Notes," "List," "Photo" and "Audio." 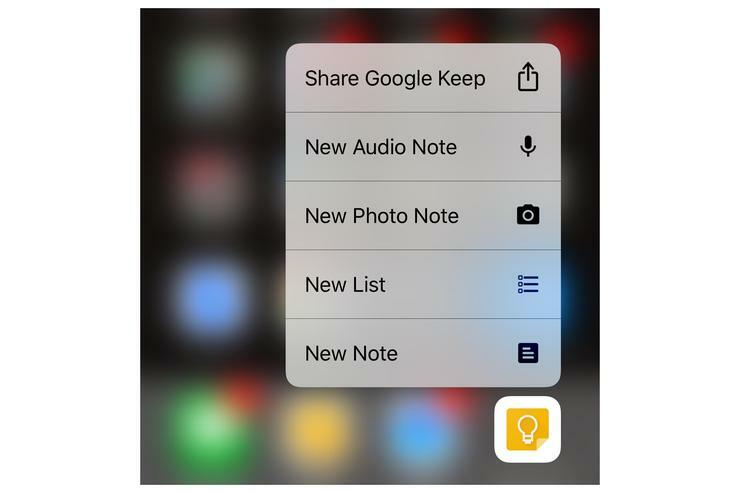 Just create any kind of Keep note, then tap on the Reminders icon. Use Keep as a "smart napkin"
The Android version of Keep allows free-form sketching and hand-written notes, just as you might do on a napkin at a lunch meeting. (The iOS version of Keep will get this feature soon, according to Google's Anima.) The difference is that Google applies amazing A.I. to make your doodles searchable. Google can recognize and convert into text most hand-written scribbles. Even more amazing, Google A.I. can even recognize some of your drawings. So if you sketch a house, a car and a martini glass, you should be able to find the sketch later by searching for these words. Google recently demoed this A.I. inside a fun game called Quick Draw. Google guesses what you're drawing in real time, as you're drawing it. Open the Keep app for Android and tap "New drawing." You can also add a drawing to an existing note or draw all over a photo imported into Keep. Once you're in drawing mode, use the various drawing and highlight tools to enhance your drawings. Use drag-and-drop to rearrange your notes or "pin" notes to the top. Here's a secret shortcut that brings any note to the top of the rotation, but not "pinned": Archive the note, then un-archive. When it emerges from the Archive, it will be placed as if it were a new note (the "archive" button is a box with an arrow on it). Don't just capture your ideas in Keep. Develop them over time. This is the single best Keep tip for creators. Sure, when genius strikes, capture the idea. But go back and spend quality time with your notes. When you have further thoughts or find related facts or resources, add them to the existing note. Write entire passages (because ideas about how to express or articulate something need to be captured, too). You can also dragoon others into helping you to develop your ideas by simply tapping on the "Share" button on the desktop version or the "Collaborators" item on the mobile app's "More options" menu. Is your idea ready to hatch? "Graduate" the Keep note into a Google doc. On the mobile app, the "Copy to Google docs" option is on the "plus" button in the lower left. On the desktop browser version, it's on the "More options" menu (the vertical dots). Each note can be up to 20,000 characters in length, roughly 12 times the length of this column, and the title field maxes out at 1,000 characters. For lists, each item can be up to 1,000 characters and you can have up to 999 items per list. Make Google Keep central to your life. Use it obsessively. When you do that, t becomes a mirror to your mind, an extension to your thought processes that never forgets -- a nursery for your best ideas, projects, goals and plans. As Google evolves Keep's A.I. and connects it to the services you use every day, the distance between inspiration and execution grows ever shorter. Google Keep isn't a dumb yellow sticky note app. It's an always-present, A.I.-powered tool that magnifies the powers of your mind.